Mumbai: Restructuring exercises initiated by buyout specialist Wilbur Ross in SpiceJet Ltd are beginning to show results, at a time when local carriers are expected to post a combined loss of $2 billion (Rs9,360 crore) in fiscal 2010. Ross injected $80 million in India’s second largest low-fare carrier in July 2008 through his New York-based private equity fund WL Ross and Co. Llc, which invests in and restructures financially-distressed companies. He also brought in 41-year-old Sanjay Agarwal to run the airline, and he in turn hired nearly a dozen senior executives. Agarwal also brought back G.P. Gupta—who was vice-president, finance, before joining rival GoAirlines (India) Pvt. Ltd as chief financial officer—as SpiceJet’s chief administrative officer. Ross did not reply to emailed queries but suggested questions be addressed to chief executive Agarwal. “There was no magic wand or (something that) required radical changes. It was just pure common sense," Agarwal said. “There was a problem of lack of leadership and cost focus to be addressed. And we simply did it." While he declined to comment on SpiceJet’s profitability, Agarwal said the industry would show profits by the next fiscal, considering passenger growth and no capacity addition. DSP Merrill Lynch said in its report that it expects SpiceJet to register passenger CAGR (compounded annual growth rate) of 25% on an 18% CAGR increase in available seat kilometres, and 10% higher load factors during fiscal 2009 through fiscal 2012. “We expect SpiceJet to improve its yields by around 5% as supply remains under check and legacy carriers increase fares to return to profitability," the report said. “We are already seeing SpiceJet improve its yields by approximately 25% over the lows of 2QFY10 (the second quarter of the current fiscal)." 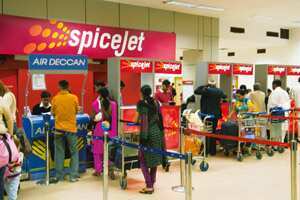 New Delhi-based SpiceJet had a market share of 12.2% in November in the low-fare category, second to the 14.1% market share commanded by rival airline IndiGo, run by InterGlobe Aviation Pvt. Ltd, according to data from the Directorate General of Civil Aviation. According to data furnished by the ministry of civil aviation on 19 November, IndiGo is one of the two airlines that made a profit in 2008-09. IndiGo posted a Rs82.16 crore profit for the year, while full-service carrier Paramount Airways Ltd posted a Rs7.26 crore profit. The full-year loss for SpiceJet was Rs352.50 crore. However, SpiceJet still faces pricing issues. “Clearly, IndiGo has better market share and, hence, SpiceJet will be forced to follow the fare trend set by IndiGo," said an aviation consultant, who advises domestic and international airlines. Speaking on condition of anonymity because he did not want to antagonize clients, this consultant said bigger airlines are rapidly moving into the low-fare space, and this could adversely affect SpiceJet’s margins. “Also, SpiceJet is ill-equipped for another round of price war," he said. Over the past month, SpiceJet’s shares have risen 17.44% to close at Rs51.85 on Tuesday on the Bombay Stock Exchange, while the bellwether Sensex index has lost 1.94% in the same period to close at 16,692 points. Although most airlines have identical expenses, such as jet fuel, airport levies, salaries and lease costs, Agarwal said SpiceJet was doing all it could to keep costs down. The DSP Merrill Lynch report points out that SpiceJet has at least 30% lower cost than legacy carriers such as Jet Airways (India) Ltd and around 10-15% lower than low-fare carriers such as JetLite (India) Ltd.
“We fly our planes around 12.25 hours a day. We are carrying more passengers on per departure basis today with bigger planes with 212 seats," Agarwal said, adding that aircraft utilization would be key in its strategy to expand to international destinations. The report also points to the seat design and materials used that allows SpiceJet to fit at least 10-15 seats more than other single-class airlines using similar aircraft. “This further reduces cost along with increasing revenue potential," the report said. Moreover, the carrier is not adding more planes to its fleet, keeping expansion to just nine aircraft through 2012. Agarwal said the airline is also in the process of increasing its brand visibility as other factors such as fares and routes are similar to those of other airlines. SpiceJet has appointed digital marketing company i-Vista Digital Solutions Pvt. Ltd to enhance visibility for the SpiceJet website. “Having said that though, one must take into account that the other airlines do still have excess capacity," Mama said. “Naturally, that will affect SpiceJet though (for) no fault of its own." If airlines were to repeat past mistakes, including cutting fares to a level where they can’t recover costs, “it would also affect the fortunes of SpiceJet to the point where it may not be able to break even", Mama added.